France in London | Football : France beats England on home turf ! Football : France beats England on home turf ! Entrance E, Block 505, Rank 15, Seat 143. Here I was in the legendary Wembley stadium, witnessing France's 2-1 victory against England. No comparison with the stadiums I have visited in the past, Wembley is definitely more impressive than Saint-Denis Stade de France or even Madrid Santiago Bernabeu. I leave it to your imagination: 85,000 fans for a friendly! You might say that England against France is not an ordinary match, but you would never see that in France. As La Marseillaise rang out in the Stadium, right after the players entered on the grass, I noticed that there were many more French people than the 2,000 initially expected. You could have been in South Kensington ! I could see some relics of the glorious French football past : Zidane 1998 shirt and even Henry 's 2006 one (some people are definitely shameless!). As I sang the anthem, the guy sat next to me, Sam, a mid-twenties English fan, proudly wearing an England scarf and Steven Gerrard 2008 England shirt, somehow figured out that I was French - queue obligatory snigger "A frog in the stand !”. Then it was the turn of God Save the Queen : all fans singing in chorus with a fantastic tifo. That was definitely a memorable moment. Sam asked my French friend what his favourite team was '. He proudly replied:" Paris Saint Germain " only to then be asked "Do they play basketball' ? 1-0 to Sam. A sign that France is no longer a great footballing nation? Certainly no-one would ask whether Chelsea were a hand-ball team...but you can't blame England supporters for being a bit complacent about victory, especially after the World Cup disaster which substantially heaped shame on French football. This is why, although England coach Capello was forced to line up a new-look and an inexperienced team, English fans could not even begin to imagine that England could loose in their Wembley temple. Sam said to me that he was sure his team would take revenge for their 1999 2-0 defeat against France. His chest swelled even more with pride when promising 6”3 forward Andy Carroll won a free-kick within the first 60 seconds. But Steven Gerrard sent a low drive skidding across the slick surface into the grateful arms of Hugo Lloris. That was the moment when Sam could be proud of his team in the first half...and the last. His hopes were soon shattered as France seized control of the match and refused to relax their grip. Karim Benzema, who has trouble convincing José Mourinho to play him at Real Madrid, but whose importance to 'Laurent Blanc', France's new coach, is beyond dispute, emphasised the visitors' superiority with an early goal in the 16th minute. Jagielka and Rio Ferdinand were moved out of position by a slick one-two between Malouda and Benzema before the Real Madrid striker drilled in a low drive which beat Foster at his near post. In the first half, each French attacks threw Capello's players into a panic. They were no match for Nasri and Malouda's brilliant speed, and couldn't compete with Gourcuff and Mvila's technical accuracy. It seemed Laurent Blanc's gamble of taking risks by keeping an offensive style of play with 5 offensive players was really paying off. They were enjoying the fluidity of play that England seemed incapable of breaking up. England's main tactic of hoofing the ball forward for Andy Carroll to try and head, was repeatedly rendered useless by the surprisingly insurmountable defensive duo made up of Mexes and Rami, not to mention Eric Abidal, who was offered a chance to seek public redemption after being involved in the pathetic strike at the World Cup. England rarely crossed the halfway line, and their lack of motivation was unworthy of the English fans' astonishingly huge support. But unlike their team, Sam and all his fellow English fans remained hopeful. 'Mexican waves' repeatedly moved around the stadium, and Sam kept on chanting ('England, England'...and 'There were 10 German bombers in the air...'). But it came as little surprise when, in the 55th minute, Sagna's cross flew to Mathieu Valbuena whose right-footed connection sent the ball tidily into the corner of the net. Wembley was now eerily quiet, and La Marseillaise was to become the hit of the match. Sam blew his cheeks in annoyance, his belief in his team slowly draining out of him. During the 63rd minute, the home crowd were finally given something to get excited about as a Johnson set-piece from the right went deep and Gerrard met the bouncing ball with a header that sent it grazing the top of the bar as it went behind. England's game got better in the last ten minute thanks to more incisive - if not more efficient - offensives. This was mainly due to substitutions and the attacking power added by Peter Crouch. His best moment was when he stretched out a leg at the far post to turn Young's corner beyond France's keeper Hugo Lloris. I suddenly felt a bit nervous at the change in the way the wind was blowing at Wembley, while Sam was slowly regaining confidence. But thankfully Danish referee ended by calling what was a relatively straightforward win for France. Another surprise came when the French players uncharacteristically waved to their 2,000 euphoric fans, cooped up in a corner of Wembley's stadium. In conclusion, the 2-1 win underlined the fact that though France may have had an even more catastrophic World Cup than England, 'Les Bleus' team make-over appears to have only done them good. Laurent Blanc is successfully continuing with the reconstruction of French national football and with that is giving the team the opportunity to add another glorious victory to their record as they win their fourth consecutive match. 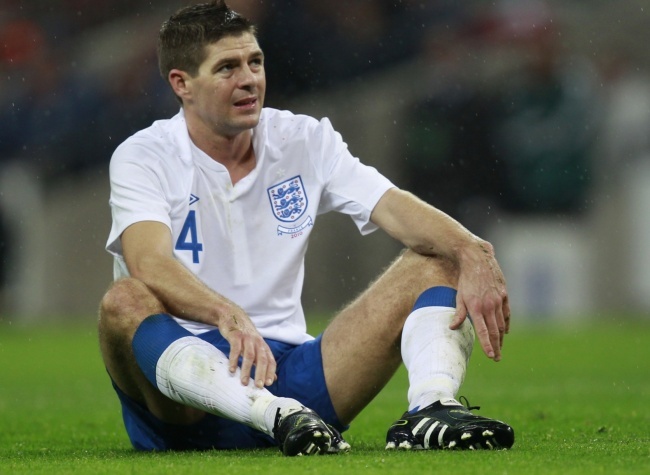 On the other side of the spectrum, the England team which was made up of novices (Henderson, Carroll, Bothroyd), lost the physical battle by a wide margin. They were technically surpassed by France's seductive style of play characterised by short passes, fluid movement and continued ball possession. This is undoubtedly due to the inexperience of Fabio Capello's young team, who simply were not up to the task of playing this high a level. But doubts run even deeper, with some asking whether the Italian coach is still the man of the hour, and whether England is still capable of competing against the best international teams. Poor Sam !